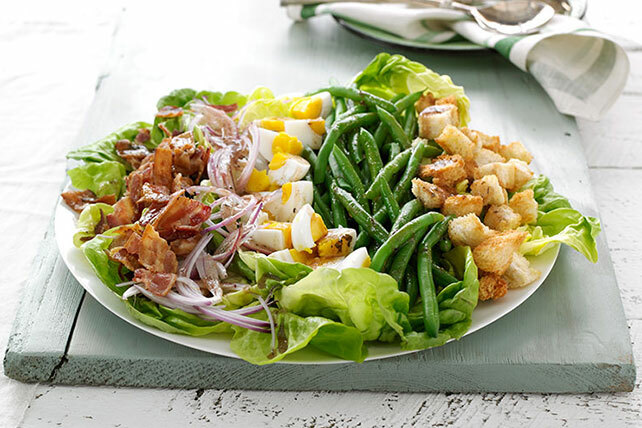 Delight in our delicious Bistro Salad recipe! Our Bistro Salad goes glam with a sleek arrangement of veggies next to eggs and bacon, topped with balsamic. Arrange bacon, onions, eggs, beans and croutons in rows over lettuce. Drizzle with dressing; toss lightly. Add beans to large pot of boiling water; cook, uncovered, 3 min. Drain. Immediately plunge beans into bowl of ice water to stop the cooking process. Cool completely. Drain beans, then pat dry before using as directed. Prepare ingredients as directed; place each in separate airtight container. Refrigerate up to 24 hours before assembling salad as directed.